Llandilo Talybont 1558-1603 Str. Chr. 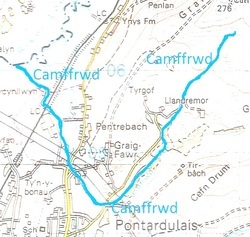 of the Llwchwr River into present-day Carmarthenshire. Place-name evidence is all that remains of the bridge near to the church of Saint Teilo. There is no structural or archaeological evidence of the bridge. If the place-name evidence is accepted as genuine, then the said bridge would have been in existence before AD 1119, the earliest recording of the place-name. If the bridge was in existence when Saint Teilo founded his church on the marsh, then it could date back to the 6th century. Indeed Rivet and Smith hint at a Roman river crossing at this point across the Llwchwr [Place-names of Roman Britain]. The bridge was probably wooden and could easily have been destroyed by enemy fire or left in a state of decay and washed away by the river’s winter floods. The presence of a Norman motte and bailey castle [see Castell du] on the southern bank and two similar, possibly earlier, defensive mounds [Banc Llwyn-domen and Banc-yr-eithin] on the northern bank strongly suggest a strategic position to safeguard such a bridge. Ty is an honorific prefix; Ty + Eilo > Teilo. St. Teilo Street and the former Teilo Tinplate Works were also named after the venerable saint. How the book left Llandeilo Fawr and arrived at Lichfield is interesting. Melville Richards, writing in the National Library of Wales Journal (1973) submits that, it was taken by Hywel Dda, in late May of the year 934 to Winchester, and handed to Aelfwine, Bishop of Lichfield, in the presence of Aethelstan King of Wessex and Mercia. He further purports that this was done either to bond the Celtic Church in Wales to the already established Roman Church in Wessex and Mercia, or to appease a long running grievance that the monks of Lichfield had with the men of Deheubarth. The telych element that occurs in the Bryntelych farm-name is a very old place-name element. It is evidenced in Tir telih of the marginalia of the Llandeilo Gospel book. Its a shame that local and popular etymology has dissected the telych element of Bryntelych to a fanciful,clumsy and erroneous Bryn tyle’r ych. This is unfortunate. Telych is a bone fide place-name element. It is found in the oldest existing written Welsh. It is also consistently found, in various guises, in the Bryntelych list above, dating back to 1621. Its meaning may be obscure, but its pedigree and antiquity is to be revered and treasured. Bryntelych and Llandeilo tal-y-bont have two elements [telych and Teilo] that link them with an ancient book of gospels and our early Christian church. It is important that the significance of these elements is not lost. The Glamorgan Arms public house stands on the site of the former Bryntelych farmstead. Llandre more 1660-61 Badminton Man. Landremore vach 1764 G. Pow. Landremore Faur 1818 BF Est. Landremorfawr 1849 M & I, Mem. and the personal name MOR. See Ar Draws Gwlas p. 69, Enwau Lleoedd p. 60 & Enwau Afonydd a Nentydd Cymru p. 82. LLODREMOR probably has a meaning of MOR’s (religious) SITE. This may well be due to his close association with the church of Llandeilo Tal-y-bont, as church member and as holder of the church tithes, probably from 1537, certainly from 1568 to 1581. Parishioners would have paid their dues, more than likely in the form of livestock, produce etc. probably at his residence in Llandremor. Over the years, Llandremor became the name of a number of farmsteads, some with a distinguishing second element, viz. Llandremor, Llandremor Fawr, Llandremor Fach, Llandremor Uchaf and Llandremor Ganol. P.S. Llandremor continued the religious theme with Howell Harris visiting fellowship meetings there many times during the eighteenth century. Castell Ddu Road 2005 Nameplate, Waungron. Welsh, castell + du = black castle All the forms from 1584 above are scribal attempts at the place-name’s two Welsh elements, castell and du, combining as a grammatically correct Castell du. Castell du was originally a castle name, which became transferred to a farm-name. Following the Norman invasion of south Wales at the beginning of the twelfth century, the three first castles built by the Frenchmen to consolidate their position in the Lordship of Gower, were at Swansea, Loughor and Talybont. The early strongholds were timber constructions, and as such, the tower of Talybont was attacked and burnt to the ground in a fierce Welsh onslaught led by Rhys ap Gruffydd in 1215 A. D.
It is probably the charred remains of the Tower of Talebot (talybont) that gave the ruin its appellation of Castell du – the black castle. The name of the ruined Norman castle was transferred to that of a nearby holding and the farm-name Castell du remains with us to this day. Hugh de Meules was the name of the Norman in charge of the garrison at the tower of Talybont. It is unfortunate that the late 20th century road nameplate in Waungron has adopted the infrequent Castell Ddu orthography. Although the noun castell is regarded by GPC as both masculine and feminine, Y Geiriadur Mawr classifies castell as masculine only. J. Morris Jones in A Welsh Grammar states that nouns ending in –ell are feminine but, lists castell as one of the exceptions to this rule i.e. castell is masculine. Examples where castell is deemed to be a feminine noun are rare. There is only the 1844 Tithe Map Castell ddu in the list above, as well as sporadic examples of Castell-ddu, 1831 OS Llanfihangel Iorath, Carms., Castell-ddu 1834 OS Llanwnnen, Cards., Cast. Gogh 1578 Saxton, Welshpool, Castelle Gogh 1536-9 Leland, Whitchurch, Glam. and Castle Went 1586 Wm. Camden. These exceptions may be attributed to non-Welsh speakers' scribal errors. History and local linguistic tradition supports Castell du and Castell Du Road. Deric John Nov. 19th 2005. Taly kelyn llwyn 1584-5 Pen. 120 f.514. Fortunately, Prof. Emeritus Gwynedd Pierce discussed the etymology of this farm-name in the Ditectif Geiriau column of the Western Mail and subsequently in Ar draws Gwlad 2, 1999. Previously, and in its present form, Talycynllwyn had proved to be problematical for toponymists. The last element appeared to be the Welsh word cynllwyn meaning ‘ambush, plot’. Meaning: The end of the holly bush. alias Tuy Rush 1764 G. Pow. KC. Ty-rwsh or Ty’r hwsh was part of the Llwyn Cwrt Hywel estate. The early Ty Rwise (1699) probably contains the Welsh noun 'rhwys' as its second element. Rhwys (vigour, power; pomp, ostentation) could well apply to one of David William's properties. In his will he leaves the leases of Llwyn Cwrt Hywel, Tynycoed, Ty Rhwys as well as a fulling mill (probably the Pandy, adjacent to Ty Rhwys) to his wife and sons. In the will of another David William (1760) probably his grandson, the property is written as Ty Rwsh. This follows the local linguistic custom of pronouncing words containing 'is' or 'si' as 'sh', cf. isel/ishel, isaf/isha, eistedd/ishte, Gwenlais;Gwilash etc. Ty Rhwys would be a very suitable name for the dwelling of a man of standing and prestige. Llwyn Cwrt Hywel (v. s.n.) evolved in the vernacular to Llwyn gwr tawel (the quiet man’s grove). Ty Rwise/Rwsh, on the Alltiago Road was also called Llwyn Cwrt Hywel fach, loc. dial. Llwyn gwrtawel fach (the very quiet man’s grove) which in turn became jocularly known as Ty’r hwsh (the house of hush), [note the PR forms 1826-42]. Ty’r hwsh lost the aspirate and in loc. pron. was Ty’r’wsh. The final elements were joined to produce the Eng. sounding noun rwsh erroneously thought to be Eng. ‘rush’ or even ‘rushes’ with a new meaning of a house built in a rush, or a house with a roof of rushes. In time the jocularity of the house of hush was lost, as well as the meaning of the original Ty Rwise (Ty Rhwys). Kevendrim 1764 G. Pow. KC. WGA. CEFNDRUM is the name of a large tract of mountain or common land, a farm-name, the name of a colliery, a house and a bungalow. CEFN and DRUM appear to be tautologous i.e. have the same meaning, the former being Welsh from Brythonic, the latter Welsh from Goidelic or Irish. This has implications of co-habitation in this district between Welsh and Goidelic speaking Celts. It is widely accepted by Celtic scholars that the Goidelic or Old Irish tongue survived in Wales as a spoken language until the end of the eighth century AD. Place-name evidence as well as Ogam scripted monuments confirms its existence on this side of the Celtic Sea. If not tautologous, then the cefn could refer to the back, or back end of the drum. This however would need the definite article i.e. cefen y drum which is not evidenced. Elements: cefn, trum. Meaning: mountain ridge of the mountain ridge. Cae newydd = new field. Y Pandy bach or the ‘little fulling mill’ was situated between present-day New Road and Bryn Road, opposite the entrance to present-day St. Michael’s Avenue. The second element bach was a distinguishing element between the two fulling mills viz. Y Pandy at Y Felin Uchaf and Y Pandy Bach at Y Felin Isaf. [TS] Wern v. gwern; Wain isaf v. gwaun, isaf; Wain dan y wern v. gwaun, tan, gwern. [Deeds, 1798] Caer Dyntre v. cae, ’r, deintur. Bank y bo, Bancybo House 1891 Census; Local etymology links Bancybo to a fanciful Banc y bwci bo. There is no evidence to support such an etymology. constructed c1870s and houses erected on the bank adjoining the tramroad bend. form of Bancybo dates to 1881. (now St Teilo Street), in Pontardulais village. local place-names is not uncommon, c.f. approaching coach, or a local warning of an approaching coach. the Whistle Inn. The Whit, in turn, is an Anglicisation of Y Whit. using Whistling, Whisling, Whit Place or Whit as a generic name for the district around the earlier public house. or a river with a deviation.